For more than 36 years, Rockwood TV has provided professional, quality installation of residential and commercial communication systems throughout the Halton Hills and Wellington County. 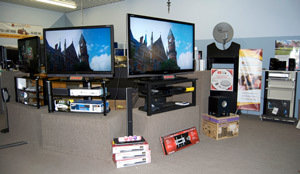 We pride ourselves on having a complete understanding of every entertainment and satellite system we offer. This understanding will help ensure that our clients' systems will be completely operational and will require a minimal amount of service once installed. Our technicians are dedicated to providing clients with fast and professional installation. To help provide our clients with the highest quality products, Rockwood TV has partnered with reputable companies such as Bell Expressvu satellite dishes, Xplornet High Speed Internet as well as retailer for SHARP and LG. Rob Gray knew what he wanted. After working for John Salmon for five years, he decided to purchase his television business, move it to Rockwood’s Alma Street plaza from its location on Highway 24, and become the proprietor of Rockwood TV. Rob, who had already operated a DJ service for about six years, was a familiar face in the surrounding area. His assistant, Art Davis, worked with electronics for decades and had already been repairing televisions for he previous eight years. Art stayed on in the business to continue his craftsmanship until his retirement - which occurred once or twice, just because he was so in tune with his work. As well as his store, Rob and his partner Randy Parkinson has made gallons of golden maple syrup for 40 years at his processing site. He’s been a member of the March Blahs Committee since its inception and also does “various forms of entertainment - dances, parties, and events - for fun.” Because of his love of good melodies, Rob has music playing at his home inside and out “24-7”, and further uses those DJ skills to provide commentary with Neil Millson for the taped viewings of the Farmers’ Parade of Lights. Residents will also know Tom Parkinson, who works in conjunction with Rockwood TV. Tom began installing and repairing antenna systems, and has developed into one of the area’s experts on satellites. Carolyn Wingate joined the lineup about 1980 and is “certainly on the front line now,” adds Rob. The closely-knit team continues to offer personal sales and service, and in-home consultations for customers who are interested in items ranging from high definition home theatre to surround sound. The store conveniently services all makes and models. 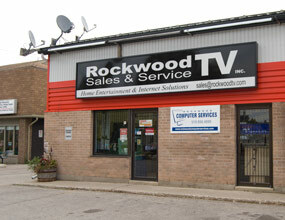 Rockwood TV soon outgrew the 1,000 square foot plaza space and about 1985 moved to its present location at 273 Alma Street, where the business has 3,000 square feet, housing a better showroom and workspace. 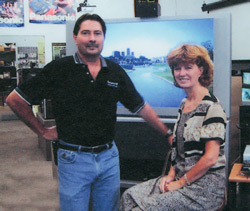 In June Rob and Carolyn celebrated a memorable 30 years in business. To celebrate their 25th anniversary, Rockwood TV held an entertaining evening at the Rockmosa Community Centre, October 16th and introduced a vision of the future. “The electronics business holds a fascination for me that hasn’t lost its charm during the years. At the anniversary party, we wanted to show people what’s coming the the next 25 years,” Rob says. We Were Established In: 1978. Celebrating 36 years in business. To provide quality product and unprecedented service. Friendly service, professional installs and quality products.